Vendsyssel FF thrashed Hundested IK 3-0 in the third round of the DBU Pokalen on Wednesday evening, with two Nigerian strikers scoring all the goals for the visitors. The game was deadlocked until the 73rd minute when former Seattle Sounders starlet, Seyi Adekoya opened the scoring after receiving a pass from Daniel Christensen. The 22-year-old Nigerian made it 2-0 two minutes later when he headed the ball into the net off an assist from Christensen. 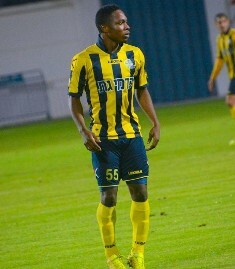 On 76 minutes, Emmanuel Ogude added further gloss to the scoreline with a third goal for Vendsyssel FF. The ex-Israeli based center forward took his tally to six goals from two matches in the DBU Pokalen, having scored five times in Vendsyssel FF's 9-1 hammering of Egen UI earlier this month. Elsewhere, FC Midtjylland needed an extra-time winner from their Nigerian star Paul Onuachu to defeat Dalum 2-1. Onuachu netted the game-winning goal in the 96th minute after coming off the bench at half time.